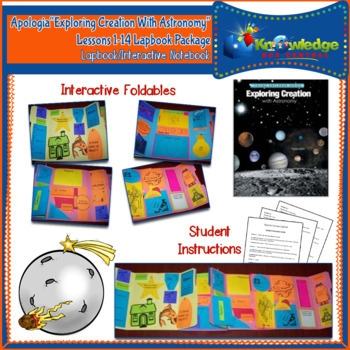 Customized to specifically be used with curriculum by Apologia and Jeannie Fulbright, this lapbook covers all 14 lessons of "Exploring Creation With Astronomy." Explore the structure of the entire solar system, each phase of the moon, and discover interesting facts about Nicolas Copernicus and Galileo. Create booklets to place inside the lapbook folders, and improve retention of the information. Includes a Teacher’s guide that specifically tells you where to find the answers to the questions within the chapters of the textbook.